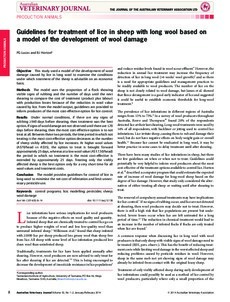 Objective: This study used a model of the development of wool damage caused by lice in long wool to examine the conditions under which treatment of the sheep is advisable on an economic basis. Methods: The model uses the proportion of a flock showing visible signs of rubbing and the number of days until the next shearing to compare the cost of treatment (product plus labour) with production losses because of the reduction in wool value caused by lice. From the model output, guidelines are provided to inform producers of the most cost-effective option for lice control. Results: Under normal conditions, if there are any signs of rubbing ≥140 days before shearing, then treatment was the best option. If signs of wool damage are not observed until there are ≤70 days before shearing, then the most cost-effective option is to not treat at all. Between these two periods, the time period in which not treating is the most cost-effective option decreases as the number of sheep visibly affected by lice increases. At higher wool values (A$70/head vs A$35), the option to treat is brought forward approximately 25 days, whereas at a low wool value (A$17.50/head) the period in which no treatment is the most cost-effective is extended by approximately 25 days. Treating only the visibly affected sheep is the best option only for a very short time for all wool values and treatment costs. Conclusion: The model provides guidelines for control of lice in long wool to minimise the net cost of infestation and limit unnecessary pesticide use.